This article is for those who wish to read and translate Greek manuscripts as close to the original as possible. Sometimes a thousand years is closest to the original, which means the copy was written somewhere between the tenth and thirteenth centuries. If this is the case, the copy was written in the Greek minuscule format. 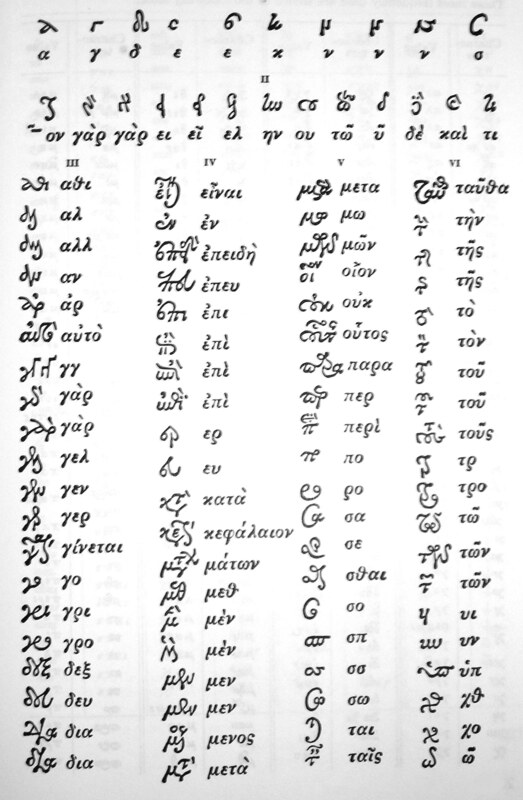 Greek minuscule is a handwriting format that was much more efficient than its earlier counterpart. It used a smaller, and much more rounder style, and ligatures — that is the combining of letter combinations into one symbol; symbols for inflectional word endings, and abbreviations. Think of it as traditional handwriting combined with a shorthand texting format. The Biblical or classical Greek student will not immediately recognize a Greek minuscule as being Greek. It takes some time to work with this writing style. Wikipedia has a good introductory article on Greek cursive writing. It also has a minuscule alphabet at the bottom. It is a good general visual, but it does not help in specifics. The Textual Critics Corner especially their list. The formatting and color choices of the website itself need some work but the text itself is a great resource. The Paulos weblog contains an introduction to the typography of such texts, including letter forms, abbreviations, and ligatures. He doesn’t have a full list, but it is a good start. Vernon Eugene Koy has developed a beta minuscule font with an almost complete listing of all the various forms along with the standard Greek equivalent. It is not known whether the font behaves correctly due the age of last posting and its self-description, but the list itself is indispensable. Fordham University has a small cheat sheet on Greek miniscule letter combinations. Some print editions do exist, though rare to acquire. On a number of occasions recommendations for Abbreviations in Greek Inscriptions: Papyri, Manuscripts, and Early Printed Books, compiled by Al. N. Oikonomides (Chicago: Ares Publishers 1974) comes up, though I haven’t found a copy yet. Another, Introduzione alla paleografia greca (1973) by E. Mioni, is very helfpul. There are some older publications available online, such as Handbook of Greek and Latin Paleography by Edward Maunde Thomson, or Notes on Abbreviations in Greek Manuscripts by T.W. Allen, though extensive on paleographical pursuits, I find that they are not very helpful in providing a useful list. An alternative option is to find a Bible passage written in Greek minuscule and compare it with a text transcribed into the traditional Greek fonts used in most Bibles and textbooks today. For example the beatitudes in Matthew 5:3–12. Click here for The Arundel MS 524 manuscript— an 11th century work found online at the British Library. Make sure the page is f.13r that you are looking at. Otherwise it is the wrong page. Matthew 5:3 begins at the end of the 15th line from the top of page. Compare it with a Greek text in a font traditionally used such as the Greek New Testament found at Elpenor’s website, or, multiple Greek texts found at Unbound Bible. If you wish to read some ancient ecclesiastical writing, like Gregory Nazianzus, here is a sample way of doing it. Connect to the internet and to the British Museum’s online Manuscript viewer, specifically, MS 14772 This is a wonderful website. The capabilities of switching pages, zooming in and out, are effortless. Then open a second browser window and link to a more contemporary Greek rendering of the same text at Wikisource. You can compare the texts in parallel and use it as a basis to understand the minuscule of MS 14772. There is also an English translation for this Oration available at New Advent’s website. It is a helpful aid, but it is old, and the translation is based at times on a Latin copy. Use it, but be careful. If you have them open and looking at both copies, the MS 14772 will appear to be chicken scratch. There are no chapter breaks, and spaces between words. Accents, glyphs, and markings abound, but don’t worry. In a few hours, using the more contemporary Greek as your guide, you will become comfortable with this format. The Greek text being used as an example is the one found at the British Library called MS 14772. It is a thirteenth century copy of a work originally written around 381 AD by Gregory Nazianzus. Specifically, it is Oration 41 on the subject of Pentecost. I hope this has been of assistance to anyone beginning their journey into reading ancient Greek texts. If you find any helpful information on this subject, please drop a line via comments here, Twitter, Facebook or email. I didn’t look at the whole thing to see whether it’s included elsewhere, but 7r in MS14772 has Or. 1, not Or. 41. A transcription of Or. 1 can be found here: http://el.wikisource.org/wiki/%CE%9B%CF%8C%CE%B3%CE%BF%CF%82_%CE%B5%CE%B9%CF%82_%CF%84%CE%BF_%CE%AC%CE%B3%CE%B9%CE%BF%CE%BD_%CE%A0%CE%AC%CF%83%CF%87%CE%B1_%CE%BA%CE%B1%CE%B9_%CE%B5%CE%B9%CF%82_%CF%84%CE%B7%CE%BD_%CE%B2%CF%81%CE%B1%CE%B4%CF%8D%CF%84%CE%B7%CF%84%CE%B1. Thanks for alerting me to this. The url generator at the British Museum is wonky. Even if I scroll to f.28r, the URL still is at 007. A manually typed URL solved this. The copy has been updated with the proper link to Oration 41.